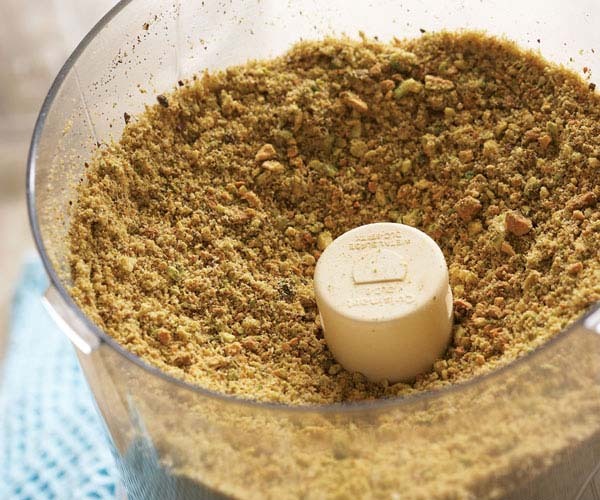 Put the pistachios, sugar, cinnamon, and cardamom in a food processor. Process until the nuts are finely chopped (the largest should be the size of small dried lentils), 15 to 20 seconds. Set aside. Melt the butter in a small saucepan. Brush the bottom of a 9×13-inch metal pan (preferably with straight sides and a light-color interior to prevent overbrowning on the edges) with some of the butter. Remove a sheet of phyllo from the stack, re-cover the rest (be sure to cover the remaining sheets each time you remove a new one), and put the sheet in the bottom of the pan. Brush the sheet with some of the melted butter but don’t soak the phyllo (remember, you’ll have about 40 layers of buttered phyllo by the time you’re done). Repeat until you have layered and buttered about half the sheets from the first pack—about 10 sheets in all. If your pan has slightly angled sides, arrange the sheets so the excess falls on the same side of the pan and cut the extra off every few layers with a paring knife. 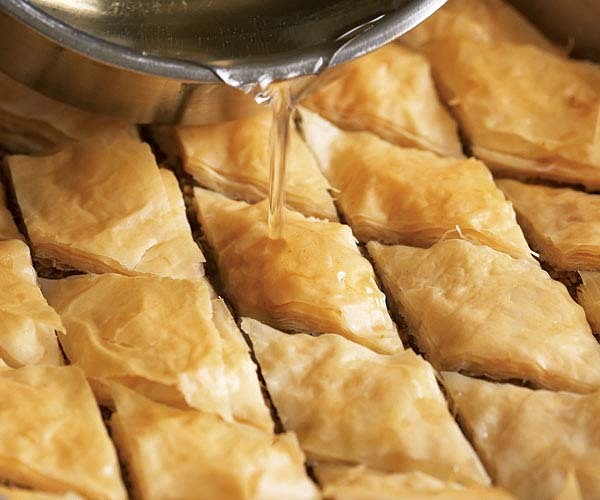 Sprinkle about one-third of the filling evenly over the phyllo. 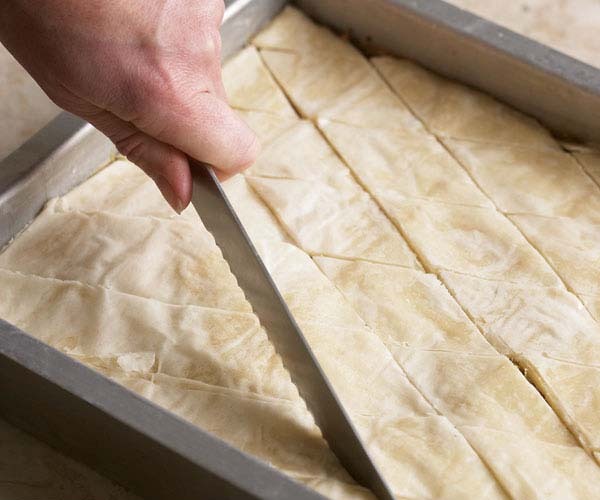 Before baking, use a thin, sharp knife (I prefer serrated) and a gentle sawing motion to cut the baklava on the diagonal at 11/2-inch intervals in a diamond pattern. Try not to compress the pastry by pressing down on it with one hand while cutting with the other. 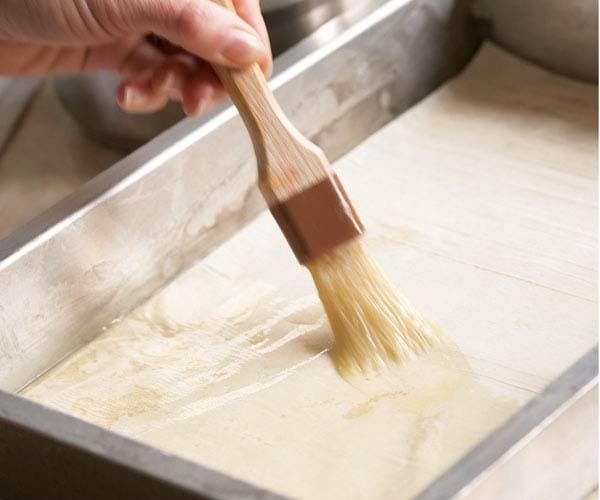 Not only are you cutting serving portions, you are also cutting pathways for the flavored syrup to permeate the pastry, so be sure to cut the pastry all the way to the bottom of the pan. If you have an electric carving knife, this is the perfect time to use it. Put the sugar and 2/3 cup water in a small saucepan and bring to a simmer over medium heat, stirring occasionally, until the sugar is dissolved and the liquid is clear, about 5 minutes. Remove the pan from the heat and stir in the orange flower water (if using). Pour the syrup evenly over the entire surface of the baklava, allowing it to run down into the cut marks and along the sides of the pan. 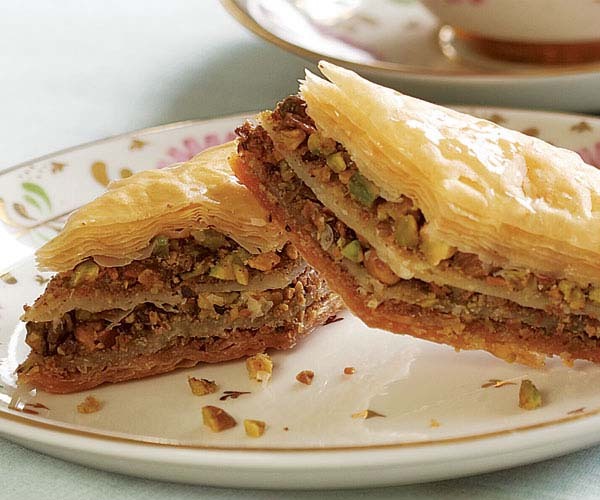 Allow the baklava to cool to room temperature before serving. Add a flavor twist: Once you’ve tried your hand at the classic version, try one of my variations. In them, I’ve blended nuts with ingredients like dried fruit, chocolate, liqueur, and espresso. While not traditional, Apricot & Pistachio Baklava with Orange-Cardamom Syrup and Hazelnut & Chocolate Baklava with Espresso-Frangelico Syrup are easily the most popular baklavas I’ve ever made. Made this for a Greek dinner party, served them with a homemade honey ice cream - holy Zeus, Batman! To say it was a huge hit, is an understatement. People were asking for goodie bags of baklava to take home - good thing I made plenty! This recipe is absolutely wonderful! 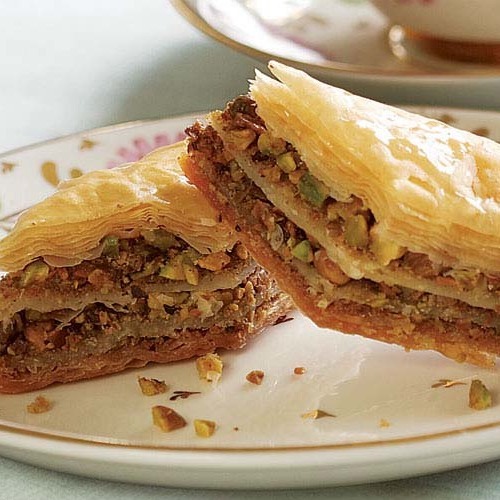 The step-by-step instructions are easy to follow, and although baklava is a little bit of work (mostly the stacking and buttering of the fillo dough), it is also inherently simple and the result is well worth the time spent in the kitchen. I have made these diamond-shaped marvels several times, and they always look as pretty as those in the picture :) everyone I have served them to have raved about them... Crispy yet moist, flaky and syrupy with just the right amount of sweetness, they ARE to die for! Thank you for sharing!